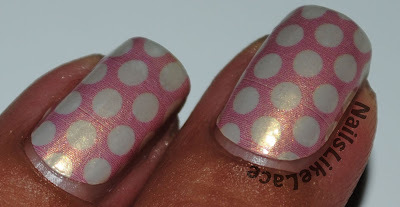 I received some nail strips from Incoco to review and show you. They sent me three packs of strips, a booklet with all the different styles they have, instructions, and information about the strips, and two files and orange wood sticks. Incoco strips are made of nail polish, so you have to use them soon after opening the package, or, as I discovered with some of my leftovers, they end up drying out within a couple of weeks. The first set I tried is called Sweetie Pie, and retails for $8.99. Bling Bling is a basic silver glitter for $7.99. Fashion Fusion is also $8.99 and from their neon collection. I tried Sweetie Pie first, and since I have used plenty of nail strips before, these were really quick and easy for me to apply. They stretch really well without ripping and they weren't too thick. To apply these, I followed the instructions from Incoco exactly. Once I found the size I wanted, I peeled the plastic off the top, then peeled the strip off the backing, and removed the silver handling bit at the end. I read a few other reviews on these strips saying there was a little bit of a lip at the base of the strip, with two different sets tried, so I did make sure to press these down all the way around the edges, as well as I could, to try to help alleviate this potential problem. It really wasn't too bad for me. They might have lifted a little by the end, but they never got caught on anything. This pack came with a silver sticker that I assumed was for resealing the package, so that's what I used it for. This only kept my strips usable for about a week. They still ended up drying out. I wore this style for about 2 weeks. I ended up with some minor tip wear and a little bit of growth, but my nails haven't been growing very fast lately, so that wasn't a surprise. Overall, I was really happy with this pack of strips. They are simple and cute, with a gorgeous, hidden gold shine. The textured look of the pink background is a little odd, but it is not too distracting, and for the most part, it just looks like a smooth pink from further away (the distance at which most people will see your nails). To try to prevent tip wear, I wore the Bling Bling strips second and applied one coat of Seche Vite topcoat over them. No matter how well I pressed the strips down around the edges, though, Seche made the lifting at the cuticle terrible immediately! I ended up only wearing this set for a day because they started to lift and peel too bad due to the topcoat, so that's not a good solution! The final set was hard to get good, color-accurate pictures of. The packaging pictures are pretty close, but they came off a little lighter when I took pictures of them on my nails. With this set, instead of adding topcoat and causing them to lift, yet still wanting some extra tip protection, after I put the strips on, I capped just the tips of my nails with black polish. Putting polish just over the tips seemed to be the best route! Of course I completely forgot to take "after" pictures, but it lessened the tip wear some. Enough that'll I'll definitely be going with that method the next time I try any polish strips! This neon set did seem to be a little thicker than the other two and slightly harder to stretch, so I had more bumps and folds in these, which made them wear in those areas faster, but they are still really pretty! I especially love the detail in this last set that I tried! I wouldn't be able to paint that design myself, and those are the kinds of strips I like! If they're simple or plain, I don't see much point because I can do that art myself. I cannot paint lace, though, so this was the star design for me! Product provided for to me for free my honest review from Incoco. No compensation was received.